Location: The new hotel Rodopi is situated in the Southern part of Plovdiv, on the road to Sofia, Pamporovo and the Rhodope mountain, near the Plovdiv Customs Building, only 5 minutes driving from the centre of Plovdiv. Room Amenities: All the rooms and apartments are air-conditioned, with cable TV, fridge and direct dial telephone. 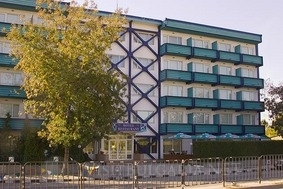 The room service and the Conference hall is free of surplus charges. A secure parking lot with 32 car places is available for the guests of the hotel.